A “new” piano arrived this week – a c.1898 Bechstein in Rosewood. Pictured here are the frame supporting posts, removed and numbered preceding removal of the old soundboard (which is in a very bad way!). This particular model of Bechstein seems to confuse my electronic tuner – something to do with the scaling and bridge design in the second section. So this afternoon I decided to tune the piano aurally, which is something I haven’t done for a long time. It was rather liberating to be honest! I found myself remembering my apprenticeship days sitting amongst a sea of pianos while I learned to tune with all sorts of workshop noises going on around me (good practice for tuning in restaurants and so on!). I’m definitely out of practice, but was happy with the result. Probably the last tuning I’ll do before Christmas, so I’m glad it was such a nice piano! Along with my Fujan carbon lever, I also got to try my new 30mm wide felt wedge. It’s so nice to use good tools. After rebuilding the action for my Bechstein “A” Sheraton, and fitting new hammers, a few of the keys were too light touch wise. I removed an old key lead, plugged the hole (you can see the new plug just behind the black portion of the key), then re-assembled the action with the newly plugged keys in place. In the picture here you can see the 52g touch weight on the front of the key, and a new 15g lead resting on the top of the key near the balance point, with a mark on the side of the key ready for drilling. 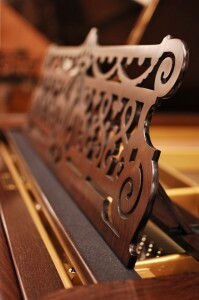 The finished piano can now be viewed at Handel Pianos.